Q: How do you address your salary or hourly expectations when an interviewer asks what you’re currently making, and how much you’re looking for in your next role? I’m trying to elevate my position to a more managerial role with a salary increase, and I don’t want my new salary to be dependent on what I’m currently making. This question is very frequently asked in the interview by recruiters and hiring managers, both for informational purposes and also to gauge whether or not a candidate fits within the financial stipulations of the position. First, in addressing your current salary, you always want to be honest, as this is on-the-record information that they can, and will, validate. If you’re caught lying, it could cost you the position, and at the very least, it will damage your reputation. So be upfront, and then how you address the next piece of this question will depend upon your job search goals. I’m currently making $53,000 as a base salary, with a potential for performance-based bonuses. Next, you want to address the salary that you are looking to make in the next role, with the likelihood that you’ll be taking on additional responsibilities, or moving up the chain. It’s natural that there will be a gap between your current salary and your expected future salary. Sometimes that gap may be larger than feels comfortable communicating. This can particularly be the case if you work for a company where your compensation is lower than market demand, but you accepted the role in exchange for other perks, such as increased vacation time, flex hours, or the chance to get in at the ground level of a startup organization. 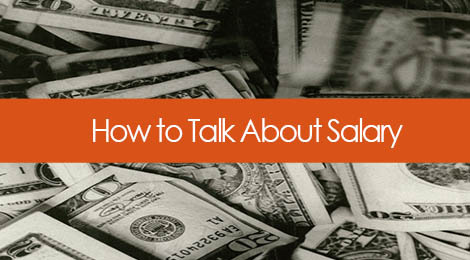 It’s okay to communicate that aspect as well when trying to sell yourself at a higher level. If you’re not sure what the position pays, offer them a range – with the lower end being the minimum of what you’re willing to go in at, and the higher range being the ideal so that ideally they come back somewhere in the middle. I’m making $53,000 currently, and since I’m targeting a more managerial-focused role, I’m aiming for something in the range of $60,000-65,000. My current base salary is $50,000. I was one of the first employees hired, and it was an exciting opportunity, so I agreed to come in at a slightly lower rate than what I typically see out there in the market. In my next role, I’m ideally targeting something in the range of $65,000 to $70,000, which is more on par with my level. Numbers aside, it’s your responsibility to convey the value of what you’re asking for. Don’t be afraid to voice your interest in moving up, taking on more responsibility, and building upon your existing skill sets. Tags: career, communication, compensation, hr, interviewing, job search, money, salary. Bookmark the permalink.